London’s housing market is a law unto itself. For years, the capital has raced ahead of the rest of the UK in terms of house price growth and remains a favorite with investors from around the world. But what makes London’s housing market unique? There are certainly factors that the English capital shares with the rest of the country. The UK faces a chronic shortage of housing and successive attempts to solve the shortage have been overwhelmed by demographic changes, including an ageing population and a reduction in the size of the average household. From 2001 to 2011, the number of households in the UK increased by 8%, with two person households accounting for 34% of all households, according to Census data. The UK simply cannot build homes fast enough. Coupled with that is growing demand for rental property, caused by rising prices. This is felt more sharply in London than anywhere else. In the City of London, the average annual salary is £48,023, according to the Office for National Statistics (ONS), yet Rightmove puts the average house price at £935,704. Price comparison website Go Compare recently reported that first-time buyers in London need a salary of £140,000 to get on the housing ladder, which falls rather short of the median average of £30,388 across the capital. London draws in bright young things from around the world thanks to its employment opportunities, cultural pursuits and world-class social scene. 16% of Outer London’s population is aged 25 to 34. The figure rises to 25% for Inner London, compared with the ONS’s figure average UK figure of 13%. But many of those who head to the city for work will never be able to buy there. Renters accounted for 50.4% of households in London, according to the last Census. The result is strong demand for rental property across the capital, making it the UK’s most attractive rental market in the eyes of many investors. The average property price in London, based on Land Registry figures, is £514,097 (as at December 2015), but there are many areas of the capital with lower entry points for investors seeking out up and coming areas, with a view to enjoying capital growth as prices rise, as well as rental income. Despite London’s prices being so far ahead of the rest of the UK, many analysts are confident that they will continue to increase. Knight Frank has projected cumulative growth of central London house prices of 20.5% in the five years to the end of 2020. On the outskirts of the city, including the commuter belt, prices are set to rise even further: by 23.4%. As developers fail to keep up with the pace of growing demand in the capital, the limited housing supply looks set to continue to push up property prices in London for the foreseeable future. According to estate agency Savills, “The market conditions we called ‘normality’ 10 years ago will not be resumed anytime soon.” It seems that London’s spiralling property prices have become the new norm. 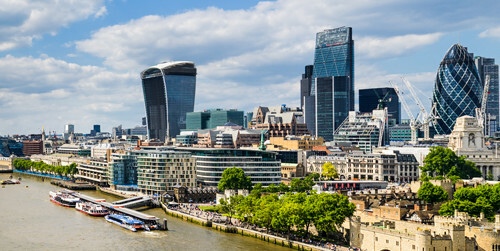 While investors are of course focused on London’s unique potential in terms of financial returns, there is also an added bonus to buying property in the capital. The prestige of owning property in London is not to be underestimated. London is famous around the world. According to the MasterCard Global Destinations Cities Index, it was expected to welcome some 18.82 million visitors during 2015, making it the world’s most visited city. From Big Ben and the Houses of Parliament to the London Eye, London’s iconic imagery is recognised far and wide and owning property in the English capital unarguably carries a certain credence. All in all, the financial and reputational aspects of London real estate investment combine to make the city a truly unique offering when it comes to property ownership. With a population of 8.5 million, 50% of whom rent their home, London provides buy-to-let investors with access to 4.25 million tenants. Coupled with the projected price rises of upwards of 20%, it’s hard to argue with the logic of making London your city of choice when it comes to profiting from a UK buy-to-let investment property.